"Three films a day, three books a week and records of great music would be enough to make me happy to the day I die." I've been thinking a lot lately about happiness. For most of my twenties, and now the first couple years of my thirties, I haven't been all that happy. Last year my therapist suggested that I read The Happiness Project, a book where a woman sets out to devote a year of her life to improving her outlook on life. The author is an incredibly privileged rich woman with a devoted husband and adorable kids, sooo, not super relatable. She had a few good suggestions (the ones that resonated the most with me were building collections, and making time for activities that you enjoy) but most of the book was focused on forming and maintaining human connections. And that's honestly just not for me. Whether it's in-person relationships or social media, I just feel out of place with people. Human relations fill me with self-doubt and confusion. People that I think of as friends usually think of me as merely an acquaintance. I constantly feel as if I am burdening others with my existence if I try to stay in touch. And whenever my brain tricks me into thinking I'm part of a tribe, I suddenly feel like an outsider. This is not a breeding ground for my happiness, it's part of the reason I'm unhappy to begin with. Personally, I need to look elsewhere. Perhaps one of the only humans that I feel a real honest to goodness connection with has been dead for some thirty years. Through watching his movies, reading his writing, studying his biographies, I feel like I found a kindred spirit in François Truffaut. And so it should come as no surprise to me that the answer to happiness should be found in a paper he wrote in 1949. "Three films a day, three books a week and records of great music would be enough to make me happy to the day I die." He was an angsty 17 year old when he wrote this, although I very much doubt that he'd have rebuked the ritual at any point in his too-short life. Last month I decided that I'd embark upon a Truffaut Challenge. Three films a day and three books a week seemed a little too voluminous for my work schedule, but I decided that at least one film a day and two books a week was much more achievable. And, of course, plenty of records of great music. I'm a little over a week into my challenge so far and I can already say that it has helped me immensely. I feel so much more contended losing myself in works of literature and film. It's also had the unintended consequence of limiting my time on social media, thereby increasing my happiness even more. And I'm finding personal fulfillment in meeting the challenge -- each day there is a goal to accomplish, and it doesn't involve work or other people. As an illustrator, I am very hard on myself when it comes to my work and I suffer from crippling feelings of inadequacy. But by spending a hefty hunk of my day reading and watching movies, I'm happily appreciating the contributions of talented filmmakers and writers, rather than wading in a puddle of creative uncertainty. I've also realized that three films a day and three books a week is actually more realistic than I initially thought. I devote at least a couple hours each day to listening to podcasts while I work at the computer - that could easily be switched out for movies (most likely re-watches since I prefer to give my complete and total attention to movies I'm seeing for the first time.) And surprisingly I finished 3 1/2 books this week after all. I also branched out when it came to "great music." Normally I would just play the same old itunes playlist that I have been listening to for the last few years, comprised mostly of songs by The Killers. But I branched out a little in two different directions -- I went on spotify and listened to some music that I hadn't heard before (and discovered I really like Florence and The Machine.) I also went back on itunes and played my 2011 and 2012 playlists, rediscovering some music that I hadn't listened to in 7 or 8 years. Next week would have been Truffaut's 87th birthday, and I'm thinking I need to up the ante a bit and make this a Truffaut themed Truffaut challenge. 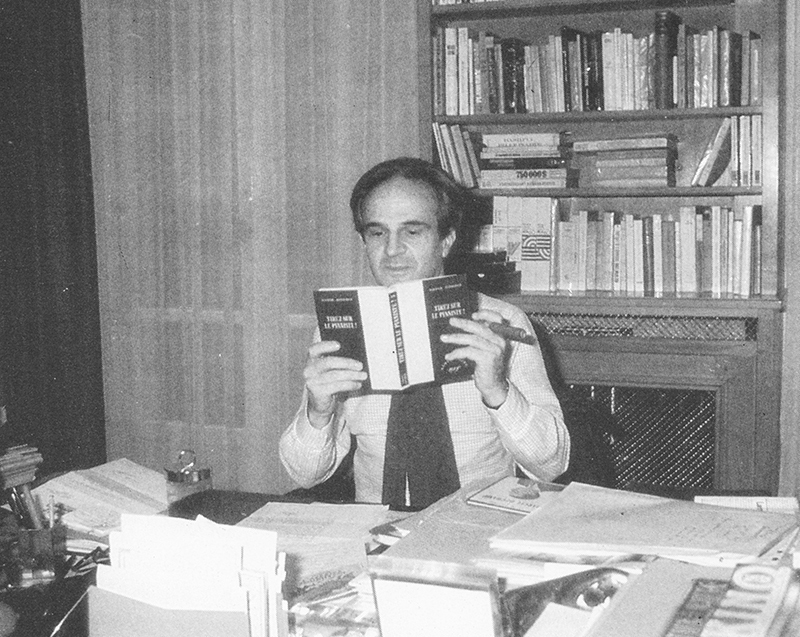 Next week my daily movies will be made by Truffaut, and my books written by or about him. This routine has already improved my mood more than any self help book or pitiful attempts at human connection ever could -- I can only imagine how happy I'll be at the end of next week, after spending it enveloped in works produced by one of my favorite people. Hi Kate! I hope you don’t mind me writing to you, but I’ve long been a fan of your work, and your piece really resonated with me. I know exactly what you mean about the whole ‘people thing’ I often wonder why all the people I really relate to are either dead or old and in other countries!! I love Truffaut's idea; books, films and music are the three things that bring me the most happiness and this year I really want to watch, read and listen more! Also as I side note I absolutely love your blog banner! That Julie Christie button!! What a great idea! I love that immersing yourself in film and books is boosting your happiness. I read that Happiness Project book a few years ago, and wow, it was so... naive? Simplistic? I did gain one insight from it that I do try to put to use in my life, though, which is that if a little chore like putting something away or whatever will take less than one minute, just do it instead of putting it off. Helps keep the clutter down. Sort of. When I remember to do it. Hee. I read about a book a week and watch about 2 movies a week, and when either of those numbers nose-dive, I get less happy fast, so I'm definitely seeing the value of this project of yours!